On Massachusetts Bay’s northern shore in eastern Massachusetts, you will find Essex County’s largest city, the City of Lynn. 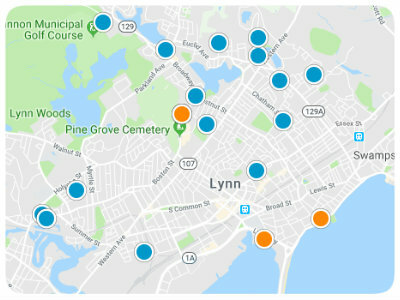 Home to roughly 90,000 residents, Lynn is a culturally diverse and densely populated commercial and urban manufacturing center with a great location and a rich history. Lynn is bordered by Revere and Nahant on the south, Lynnfield and Saugus on the west, the Atlantic Ocean and Swampscott on the east, and Salem and Peabody on the north. It sits just nine miles north of Boston, fifty-one miles east of Worcester, ninety-five miles south of Portland, Maine, and two-hundred twenty-nine miles away from New York City. Its long history, which mirrors many New England cities, is well-preserved in its museums, libraries, historical society, and numerous structures throughout the city. One such structure is the Lynn Library. A “Social Library” was created in Lynn in 1815 and in 1818 it was chartered by Legislature. A year later the library was home to a remarkable 205 volumes, and in 1850 those volumes were transferred to the Natural History Society. In 1855 the Library Association took possession of them and added 2000 volumes to the collection. In order to create a Free Public Library, all the volumes were given to the City of Lynn in 1862, which was located on the corner of Market Street and Tremont Street. By 1876 the collection had grown to an impressive 27,000 volumes which were moved to the George A. Moore-designed building in 1900, where they still reside. The building is listed as a National Historic Site and is located at 5 North Common Street. The number of volumes now housed at the Lynn Library is an impressive 125,000, which includes an excellent Reference collection preserving the intriguing history of the city. The North of Boston Library Exchange, or NOBLE, is comprised of twenty-eight libraries of which the Lynn Library is one. In addition to loaning books, the establishment also affords residents of the city with a variety of passes for area museums and attractions at low or no-cost. These passes are easily obtained by presenting a NOBLE library card, and patrons can reserve ten passes every thirty days. This amazing historical institution is one of many fabulous reasons to buy a home in Lynn, Massachusetts. If you would like more information regarding homes for sale near the Lynn Library, please give us the opportunity to assist you and contact us at your earliest convenience.